WASHINGTON, DC, July 7, 2011 (ENS) – Federal regulators have ordered the ExxonMobil Pipeline Company to to make safety improvements along the Silvertip hazardous liquid pipeline, which ruptured last week, spilling about 1,000 barrels of crude oil into the flooded Yellowstone River. Just before midnight on July 1, an accident on the pipeline, which lies six feet below the river bed, spilled oil into the river about 20 miles upstream of Billings, Montana. The spilled oil has been detected 10 miles from the pipeline break. The 12-inch Silvertip Pipeline transports crude oil 69 miles from the Silvertip station in Elk Basin, Wyoming, to an ExxonMobil refinery in Billings. Two orders have been issued – one by the U.S. Environmental Protection Agency and the other by the U.S. Department of Transportation. 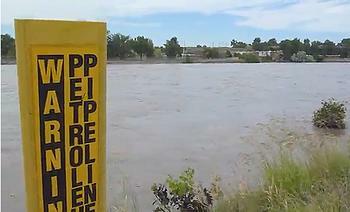 The corrective action order issued by the DOT’s Pipeline and Hazardous Materials Safety Administration, PHMSA, requires the company to re-bury the pipeline underneath the Yellowstone river bed to protect it from external damage and conduct a risk assessment on the entire Silvertip pipeline where it crosses any waterway. Exxon will then need to submit a restart plan before operation can resume. PHMSA has three inspectors on site and they are working with the U.S. EPA and U.S. Coast Guard to conduct investigations and assist in oil spill response activities. PHMSA is responsible for determining the cause of the pipeline failure, which is under investigation and has not yet been determined. 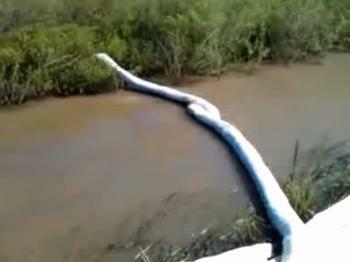 More than 76,000 feet of absorbent boom is on site, with more than 6,000 feet deployed to clean up oil adjacent to the river; more than 3,300 absorbent pads are on site with about 1,500 deployed, he said. Today, the U.S. EPA issued a separate order, under the Clean Water Act, directing ExxonMobil to take a number of cleanup and restoration activities. EPA is conducting both air and water sampling and is also directing and overseeing cleanup activities. Air monitoring using real-time instruments that look for volatile organic compounds and hydrogen sulfide is ongoing with no detections in the last 72 hours. Additionally, air sampling for benzene has been conducted between Billings and Laurel, where the pipeline ruptured, with no detectable levels, the EPA said. “Some people have noticed a strong odor near the area where the pipeline ruptured and along the river and backwaters impacted by the spill,” said the EPA. “We would expect that these odors would decrease as more of the spilled oil is recovered. If you are smelling a “gas-station-like” odor, you may be smelling volatile organic compounds, or VOCs. The VOCs in oils are benzene, toluene, ethylbenzene and xylene,” the agency said in a statement. “It is important to understand that people are able to smell some VOCs and other oil-related chemicals at levels much lower than would cause long-term health problems,” stated the EPA. “Some of the chemicals that cause odors may cause head aches, dizziness, nausea or vomiting. If you are sensitive to these chemicals, stay indoors. If possible, close windows and doors, turn your air conditioner on and set it to a recirculation mode.” At least one hospital emergency visit is blamed on the spill. Montana Governor Brian Schweitzer opened an office in Billings today to help citizens who have comments, questions or concerns regarding the oil spill. On Friday, Governor Schweitzer and state agencies will host a public meeting beginning at 10 am at 424 Morey Street in the Montana Department of Transportation Billings District Office. The office in Billings will be staffed daily 8am to 5pm by someone who can take information from citizens and help get answers to their questions or concerns. People can call the office at 406-657-0231. “Secondly, this letter serves as a demand that you preserve any and all documents relevant to the ruptured pipeline and the destruction caused by the oil spill in the event of litigation,” the governor wrote. This spring, in the wake of several major pipeline accidents, Secretary LaHood announced a pipeline safety action plan to immediately begin addressing concerns about the state of the nation’s aging pipeline infrastructure. He called upon U.S. pipeline owners and operators to conduct a comprehensive review of their oil and gas pipelines to identify areas of high risk and accelerate critical repair and replacement work. Secretary LaHood has also proposed federal legislation to strengthen oversight on pipeline safety. The legislation would increase the maximum civil penalties for pipeline violations from $100,000 per day to $250,000 per day, and from $1 million for a series of violations to $2.5 million for a series of violations. The proposal would also authorize the Department of Transportation to close regulatory loopholes, strengthen risk management requirements, add more inspectors, and improve data reporting to help identify potential pipeline safety risks early.